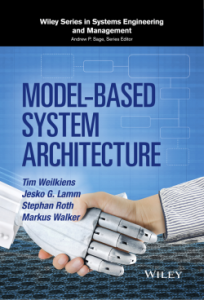 This book combines the emerging discipline of system architecting with model-based approaches using SysML. The early chapters of the book provide the fundamentals of system architecting; discussing what system architecting entails and how it benefits systems engineering. Model-based systems engineering is then defined, and its capabilities to develop complex systems on time and in a feasible quality are discussed. The remainder of the book covers important topics such as architecture descriptions; architecture patterns; perspectives, viewpoints, views and their relation to system architecture; the roles of system architects, their team, and stakeholders; systems architecting processes; agile approaches to systems architecting; variant modeling techniques; architecture frameworks; and architecture assessment. The book’s organization allows experts to read the chapters out of sequence. Novices can read the chapters sequentially to gain a systematic introduction to system architecting. systems engineers in technology companies. This book also serves as a reference to students and researchers interested in functional architectures.